Kyle Wright, the Braves' fourth-rated prospect, struck out 18 batters with four walks over the course of 12 2/3 innings this spring. 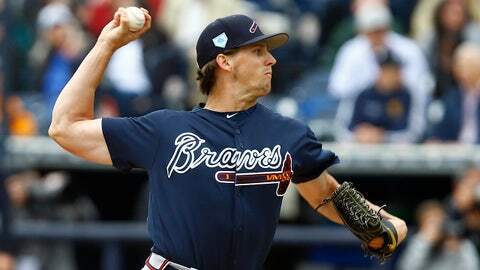 ATLANTA — When Kyle Wright got called into manager Brian Snitker’s office late last week, the Atlanta Braves right-handed pitching prospect was sure he was getting reassigned to Triple-A. The Braves announced Sunday that the 23-year-old Wright — the organization’s No. 4 overall prospect — would get an opening weekend start vs. the Phillies, while fellow righty Bryse Wilson, 21, (their eight-ranked prospect) will start the second game of the season. The righties — with one combined major league start — will be preceded by veteran Julio Teheran, who will make his franchise record-tying sixth consecutive Opening Day start for Atlanta on March 28. Left-handers Sean Newcomb and Max Fried are scheduled to make starts in the second series of the campaign against the Chicago Cubs. The Braves were forced to alter their expected rotation with Mike Foltynewicz and Kevin Gausman both suffering injury setbacks, and the Phillies’ lineup — which yes, is now headlined by the left-handed Bryce Harper and his .944 OPS vs. righties — features a string of strong right-handed hitters in Rhys Hoskins, J.T. Realmuto, Jean Segura and Andrew McCutchen. Hence going with a pair of young righty arms who had strong springs. Wright struck out 18 batters with four walks over the course of 12 2/3 innings this spring, though his ERA ballooned during a rough final outing. Meanwhile, Wilson claimed a 3.29 ERA in 13 2/3 innings pitched during Grapefruit League action, striking out 13 with only two walks. Before Wright was called into Snitker’s office — where the manager, pitching coach Rick Kranitz, bench coach Walt Weiss and general manager Alex Anthopoulos awaited — Wilson had received his own good news. So when Wright left Snitker’s office and sat down at a table in the clubhouse, Wilson peered over at him. “What did they just tell you?” he asked. “I’m starting Game 3,” Wright replied. Says Wright, “It was kind of cool moment for both of us and we got to share it together at the same time, so it was really cool. Both pitchers saw action last season, though Wright’s was all in relief. He logged six innings over four games with five strikeouts and six walks, while Wilson’s lone start arrived in a crucial series sweep of the Pirates late last summer. He tossed five scoreless innings on the road. A fourth-round pick in the 2016 draft, the Durham, N.C., native joins Daniel Norris (Toronto), Rick Porcello (Detroit) and Jose Fernandez (Miami) as the only pitchers since 2010 to start in their team’s season-opening series before turning 22 years old.